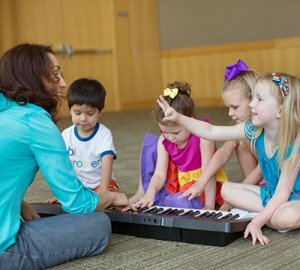 Wouldn’t you love for your child to play an instrument, maybe piano, guitar, even violin, but you’re not quite sure if now is the time? Home Materials (CD, unit book, and home instrument) will go home with your family at the start of every new theme (September, January, May) for families enrolled at the beginning of each new theme. Families joining after the first month of each new theme will be charged a required materials fee of $70 for the first child and $35 for additional children enrolling. Children must be in kindergarten (or equivalent) to join this class.